What do you have to give to others? 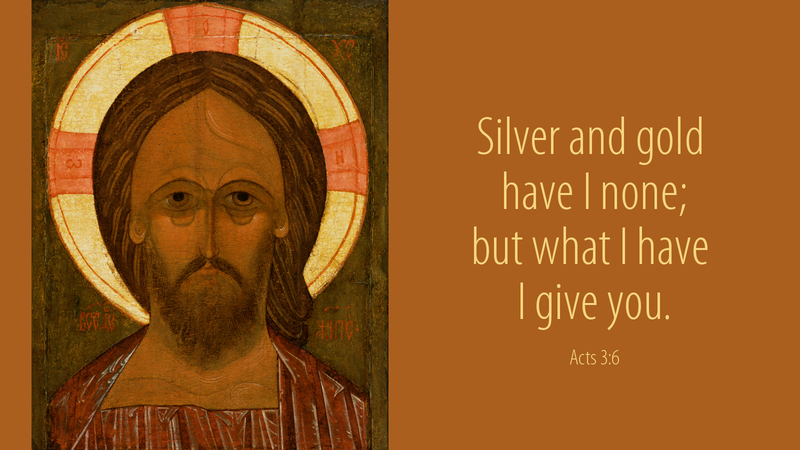 Maybe it actually is “silver or gold,” but the gift of more value is Jesus. Would you offer the life-giving Vine to another? Do his words abide in you so richly that they might well up in you as a spring of life to others, a vitalizing sap that produces fruit in God’s vineyard? This is the fruit of Christ’s disciples: that our words and deeds bring others to the Lord. So it is that Jesus’ followers always have something to give, that gift of highest value. When you come to worship, what is the great gift that you seek? Is it the joy of singing, friendship, insight, healing? These are fine gifts. Yet the greatest gift is found at the altar; it is Christ himself, given as the means of grace. See? He has set us an example. He gives himself to us, and expects that we will offer him to others. Go into all the world, giving what you have: Jesus Christ the Lord. Prayer: God of my salvation, use me today. Amen.